Since the first in vitro fertilization (IVF) birth in 1978 more than 5 million babies have been born using this method. In order to alleviate added stress for couples already experiencing difficulties to conceive, fertility scientists utilize pre-implantation genetic diagnosis (PGD) techniques to detect large chromosomal abnormalities or gene mutations that are passed along by parents to the IVF embryos. Unfortunately, it is not possible to systematically scan the entire genome of the embryo in order to detect spontaneous mutations. However, scientists from Complete Genomics, Reprogenetics, and the NYU Fertility Center believe they may have solved that problem. Scientists from the collaboration have developed a whole-genome sequencing method that uses 5- to 10-cell biopsies from the in vitro embryos to scan for potentially detrimental mutations. The results from this study were published online in Genome Research in an article entitled “Detection and phasing of single base de novo mutations in biopsies from human in vitro fertilized embryos by advanced whole-genome sequencing”. Investigators sequenced three biopsies from two IVF embryos and searched for de novo mutations, those that emerge spontaneously in the egg or sperm and are not inherited by parental genes. Spontaneous mutations are believed to play a significant role in many congenital disorders such as autism, epilepsy, and some severe forms of intellectual disability. “Because each individual carries on average less than 100 de novo mutations, being able to detect and assign parent of origin for these mutations, which are the cause of many diseases, required this extremely low error rate,” said co-authors Brock Peters, Ph.D., director of research and Radoje Drmanac, Ph.D., CSO at Complete Genomics. Typically, 5 to 10 cells are biopsied from the blastocyst embryo, and the DNA is amplified before sequencing is performed. Due to lack of replication fidelity, the amplification process introduces thousands of errors, many of which are determined to be spontaneous mutations, leading to a false positive result. The current method that the collaborative teams have developed, which uses long fragment read technology, was able to eliminate over 100,000 sequencing errors or a 100-fold reduction over currently used clinical methods. 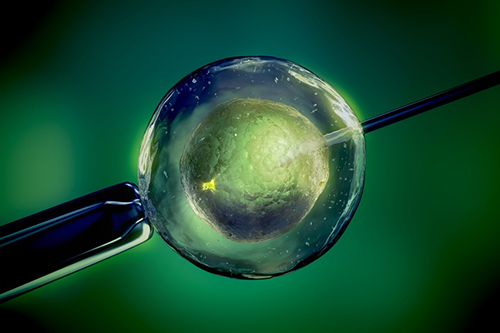 Overall, the researchers were able to detect 82% of all de novo mutations in IVF embryos. Interestingly, they did not find any mutations within the protein coding regions from the genome of one embryo, but another embryo from the same couple yielded two coding mutations in the ZNF266 and SLC26a10 genes. Mutations within these genes have led to serious diseases and defects. However, the scientists noted that they are currently unaware if the specific mutations they observed would lead to any detrimental health issues for the fetus. “The biggest hurdle now is one of how to analyze the medical impact of detected mutations and make decisions based on those results,” said Dr. Peters and Dr. Drmanac. In addition to the benefits for IVF, the scientists feel that their methodology could be employed for other clinical applications where trying to obtain cells is a challenge such as circulating tumor cells or circulating fetal cells.